Many of us have come across the concept of human-powered electronics and machines – the most popular example probably being the first Matrix movie or One Million Merits (the Black Mirror episode starring Daniel Kaluuya). However, reading about it on the internet afterwards may have rubbished the mechanics, which are often presented in rather horrible contexts, of getting appreciable amounts of energy out of human motion or physiology. On the other hand, fictional forms of human bio-energy may have just become irrelevant thanks to new breakthroughs in energy-gathering devices. Moreover, this new battery system is so thin it may be integrated into clothes that can charge your smartphone, headset or other portable tech. These battery types are developed by scientists basing their work on theories that perceive the constantly abundant amounts of everyday mechanical energy that go to waste in the absence of devices capable of converting it to storable forms. This electricity can then go on to power other concerns, such as electronics. These batteries also need to be smaller, more flexible, or ideally both, in order to fit into new smart devices as well as conforming to the form factors of better, more ergonomic wearables. Alternatively, some researchers aim to integrate them into clothes, for increased convenience and better opportunities to power them. A number of research teams have worked on these ultra-thin batteries that are designed to convert the mechanical energy of moving alongside a human carrying out everyday tasks and motion. These electronics can extract usable energy in this way, but often at the triboelectric (a conversion of friction-based energy to electricity) or piezoelectric (converting mechanical stress to the same) scale. In their current form, these effects can often only generate electricity from devices that tend to work at 5-10 percent of their theoretical capacity. This is due to their need to function at relatively high frequencies: as much as 100Hz in many cases. However, new battery strips, developed by at the Department of Mechanical Engineering, Vanderbilt University, in conjunction with that institution’s Interdisciplinary Materials Science Program. These tiny power-packs can work at 25 percent efficiency. These batteries, far from being traditional lithium-ion bricks, are made of single layers of phosphorene, or black phosphorus. Assistant Professor Cary Pint and his team at Vanderbilt have observed the ability of 2D phosphorene to generate electricity in response to mechanical strain. It does this with properties such as its sodium (Na+) ion storage capacity (2596 mAh/g). Therefore, when the team introduced these ions to phosphorene nanosheets, they could make equipotential electrodes, which generate energy and power when the ions are induced to move across the phosphorene within the 2D layers. When these were placed in an appropriate sandwiched configuration, the electrodes could convert their bending or compression into electrical power at the 0.01 to 0.1Hz range. These new batteries demonstrated the ability to produce 0.203 microjoules/cm2 (with 42 nanowatts/cm2 of power) from being bent, and 0.792 microjoules /cm2 (with 9.1 nanowatts /cm2 of power) as a result of compression. Scale these nanometer-long electrodes into a length of fabric, and you just may have a workable battery pack. Professor Pint hopes that a battery system made out of these phosphorous-rich strips could deliver electrical energy from ambient frequencies of 5Hz, but only if you are a world record holder for running speeds. Fortunately, the electrodes can also deliver electricity at much lower operating frequencies, as outlined above. The professor points out that these electrodes exist at a nearly-atomic scale, and can therefore be integrated seamlessly into clothing or textiles in great numbers. Pint claims that his phosphorene batteries can gather energy from the motion involved in both active and sedentary human activities. The Future of Battery Technology? All in all, this development seems like good news for those with emergency charging needs and nothing but their clothes and themselves to generate the power they require. However, the phosphorene batteries are nowhere near ready to include in clothing yet. The team at Vanderbilt point out a few limitations of their new battery system, most notably that the ‘amount’ of bending needed to generate the values they have reported is relatively high. These new atomic power strips have several advantages over current piezoelectric offerings, nonetheless. For example, the power and energy generated is a natural function of sodium ions and how they move over the battery’s surface, known as ‘electrochemical potential’. This also allows for the low operating frequencies needed, compared to the higher values associated with piezoelectrics, which are dictated by the resonance of the materials used in these cases. The human world of today has an ever-increasing need for power from ‘alternate’ sources. This has led to researchers devising ways to gather energy from sources such as wind, light, heat, friction, physiological processes and radiation. It may follow that people might want to store energy from their own movements for free or low-cost electricity. 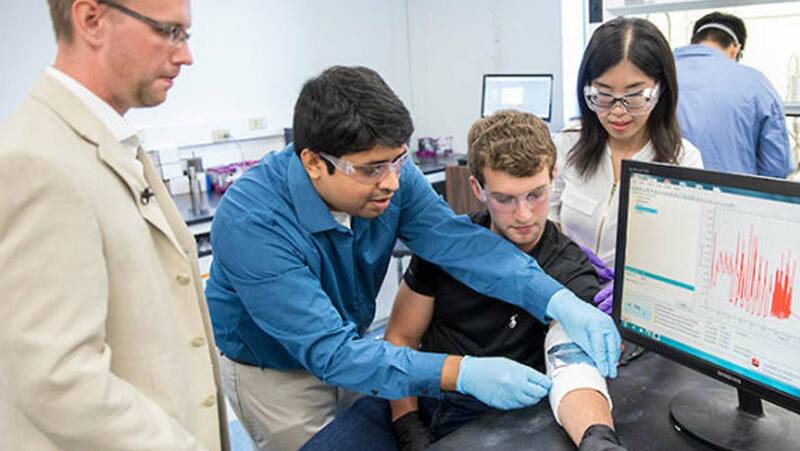 Batteries such as those developed by the team at Vanderbilt are a step closer towards converting even low-impact motion into power for wearables, smartphones or other devices. Clothes that support them may become more and more commonplace as the technology progresses. However, they would require new forms of transmission standards to get this ‘personal power’ into the device. The combination of wireless charging, for example, could make clothes-mounted ultrathin batteries and technology the perfect partners. Muralidharan N, Li M, Carter RE, Galioto N, Pint CL. Ultralow Frequency Electrochemical–Mechanical Strain Energy Harvester Using 2D Black Phosphorus Nanosheets. ACS Energy Letters. 2017:1797-803. Could the Ancient Art of Tai Chi Help Reduce Depression?